Runway Wreck | 2P START! This comic is obviously inspired by the post I made a couple weeks ago about the London fashion show that featured some hot cosplay. It works particularly well as a comic because if you were to make a list of places Pac-Man or Ms. Pac-Man should never find themselves, it would include: a plank, a cul-de-sac, and a runway. Anyway, we threw the ‘Child’s Play Charity‘ reference in there to get people to start thinking about it, as it will be upon us in a matter of weeks! Good one! As an Ms. Pac-man fanatic, i have to say you forgot her lipstick! And another thing, How can she have entered the runway without eating the dots on either side running up to it? Inaccuracies aside, I gave it a four out of five. This is a good one, made my day! So… How did she do it? lol. how come pac-man/ms.pac-man look the same straight on as she does from up above? Haha. NCG, especially since I know about the whole Pacman runway fiasco (if you can call it that). And in the first view, the dots are actually the lights of the runway, right? I was going to leave something clever, but all I can really come up with is an NCG. 3 great comics in a row, keep it up! Also, get working on that podcast! I’ve had to go two weeks the past month without any new Ray and Tim! And another thing, How can she have entered the runway without eating the dots on either side running up to it? Duh! She started the game at the top of the runway! This is awesome! A-plus..with Extra credit! It’s one of the many mysteries of life. GCG! Did not see that last panel coming! But don’t you start in the open in the same place each time? …two or three issues ago. I loved this one. Tremendously uplifted my class room time. They should seriously put some thought into leaving a power pill at the front of all pac-man based runway shows. You know, because there are bound to be many now that the flood gates have opened. The last panel should probably end up as a T-shirt. This made me think about Pac-Man in a whole new way. Maybe your on top of the maze, as opposed to walkin in hallways. Deep stuff man. Ray hasn’t put his blog up about this comic yet! Surely this is some sign of a greater conspiracy! Fact 1: Ray has not yet put a blog up under this week’s comic. Fact 2: Sonic Chronicles: The Dark Brotherhood was recently released. Ray has been playing Sonic Chronicles: The Dark Brotherhood all week long without interruption! We all knew that Ray would not be able to resist a new Sonic game. It’s like offering a beer to a recovering alcoholic. And Tim! How could you let Ray fall into old, self destructive habits like this? Be part of the solution, not the problem! Don’t be an enabler! Remember kids; just say no to bad Sonic games. Didn’t you just say in the forums that the game was pretty good so far? Hypocrite alert!!!! Kids, There’s nothing more cool than posting about a comic or game that you like. But if someone tries to spam or start a flamewar and that makes you feel uncomfortable, That’s NO GOOD! It’s your community, no one has the right to ruin a good comment if you don’t want them to. First you say “NO” then you get out of there! The most Important, you tell it to someone you trust, like a Moderator or Administrator. That’s all I have to say, though my friend showed me the clip you are referring to D3vin. 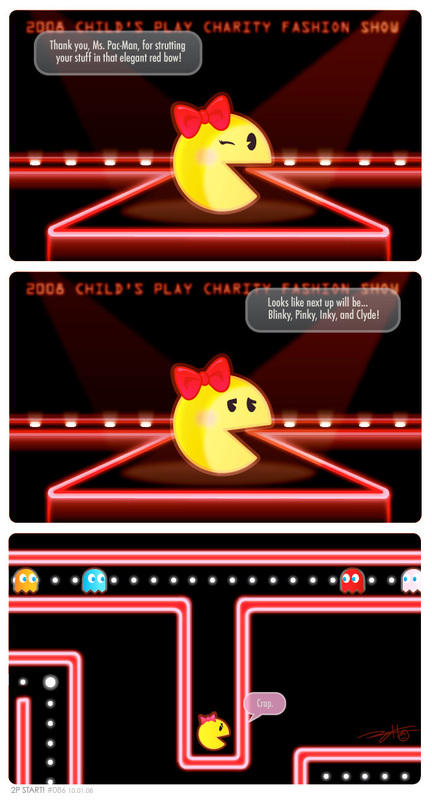 in Ms. Pac-man, it’s Sue, not Clyde. Yes, it is true that I like the game like I said in my post in the forum. I just thought my above comment would be funny, and I was hoping that it would be obvious that I was being sarcastic. Guess I didn’t pull it off right. Wasn’t trying to start a flame war or nothing. For the record, what I have played of the new sonic game is very good and I can recommend it to anyone who likes menu based RPG’s. Seconded. More shirts are a must. @DrOswald: This isn’t actually the first comic Ray hasn’t put his two cents in. It’s happened a couple times before. For instance, two comics ago 😀 . Best comic in a while I laughed a lot! xD Good job guys! I’ve been a fan of yours for a while now, so you don’t dissapoint! I JUST figured out that D3vin isn’t someone who’s talking in the explanation area of the comic w/ Ray and Tim. I just saw him as the first post a few times and got really confused until I saw that it was just saw that it was the first comment. Also, good job on the spacing Ray! That was a lot of tedious copy/paste but you totally pulled off keeping things accurately spaced. Not an easy thing to do. Kinda confusing when I have my avatar in the style of theirs huh? I was JUST thinking that earlier. I thought, “When they make a not-so-great comic, I won’t put ‘NSGCG’, I’ll put ‘This comic USED to be good…'” but you beat me to it! Blargh!